An alarm clock and my father aided me in negotiating the first potential hazard of the adventure, the early start of 5am and a departure from Cardiff airport. After a brief meet at Toulouse airport with the legend Andy Legg who took my offer of a Blues Are Back in Town in return for a quick selfie, Fisk then had to negotiate a more problematic obstacle: poor planning. I had hoped I would quite easily meet up with Bastien who, via airbnb, was putting me up for the night, but of course no. Despite assurance from my phone operators, I had no signal on my mobile and had foolishly not stored details in paper form as to where I would be staying. I felt like Tom Hanks in The Terminal as I started to wonder if I would ever leave the airport! €20 was spent in a variety of manners, in vain trying to get online or to use a phone, before a Euro 2016 rep with a map finally gave me rough guidelines about where to start my journey. I got off a tram close to the fanzone which was deserted, like a lot of places, with it being a Sunday. From here I made my way to the centre by Metro. Cafes with wifi seemed few and far between compared to the UK, but I was finally let in on the secret: McDonald’s was the place to be for this. With my phone’s battery running dangerously low due to forgetting to charge it the night before leaving, at McD’s I was at last able to log in to airbnb to find my kindly host had been trying to track me all this time (now I was more like Neo in the Matrix). With heavy bag in tow – way too much luggage for a two night trip – within no time I was to my relief in the comfort of my host’s car, he was shortly in the possession of €20 for his additional troubles and I had a key to a nice, secure little apartment where I planned to rest and recharge batteries. This done, the next inevitable mission, as every Welshman knows, was the beer one. After the expense of the flight, I’d compromised with cheap accommodation, and I found myself a little out in the sticks. But a predator will always find a way. Fisk set out on foot, putting his best foot forward and within around thirty minutes he found himself at an out of town McDonald’s, and it was this particular restaurant chain that would once again come to the rescue. A Big Mac meal was heartily devoured, with the aid of some pommes fritz sauce, which we don’t have yet in the UK but should do. Another thing we don’t have in the UK is beer at Maccy D’s. Four of these were ordered and placed in le sac. Upon return to the apartment, Fisk stuck to his resolve of staying in on the first night, so it was catching up on facebook etc prior to the evening’s game on le box – France v Les Suisses before retiring to bed. I had mis-read my travel itinerary and thought the flight home was at 4am on the Tuesday. Once I’d realised it was at 4pm, before leaving for France I made hasty arrangements to book a second night. My host for the first night was booked up on the Monday night, so I was going to have to lug my hefty bag across town once more. I once again found myself in the outskirts, this time in the University area. I arrived at Paul Sabatier station an hour early so at the campus cafe, I had a coffee and left my bag with the cafe owners who joked that it might be a bomb, though of course, you can understand any tetchiness, despite my look in shorts and t-shirt being much more of footy fan than terrorist. In the interim before my scheduled meet at 11am, I set off camera in hand to forage again – this time for food and cigarettes. Unable to access the internet just as the previous day and no sign of my next host, by around 11.40am I again began to panic. On my foraging trip, I’d passed every vegetarian’s least favourite restaurant chain, so I headed back there. I was starting to consider McDonald’s to be my bass camp! It was from here that I was again met by a very friendly host, and it was a short drive back to her house. She showed me to my beautiful room, and I was told I should allow myself to feel at home. This was a very relaxed shared house. I was in the company of a couple of young chilled out hippy types. I declined their offer of “special tobacco” but did allow myself a rest with the game still many hours away. By around 2pm I decided I would have to go out to savour the pre-match atmosphere, so I returned to the Metro and headed for the centre. 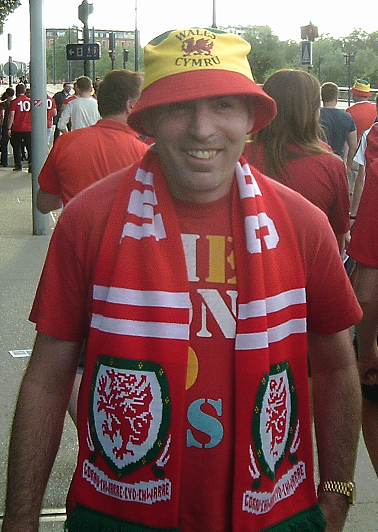 By now, there were Welsh fans everywhere and I was easily able to mingle. I’d made the decision to wear my red Stone Roses t-shirt after I’d seen them the week before in Manchester, and was picked out by one Welshman who’d been to the same gig. Still with plenty of time on my hands, I thought I would allow myself a brief bit of culture and had a quick nose around the Musée des Augustins. There were some quite impressive sculptures and artwork, but my mind was definitely more focussed on other matters. Now was definitely the time to concentrate on the night’s game and the build up. I headed for the fans’ embassy and here ran into old chums Corky who I’ve encountered on many a trip and another seasoned traveller, Neil Dymock who were manning a stall at the embassy. Corky gave me a card which he told me to keep in the event of the disaster of losing my passport, which I did actually have with me. I asked them if they’d seen my friend Dave, captain of the Wales’ Supporters’ Team who had played in a supporters’ game earlier in the day, but Neil thought it was unlikely Dave would materialise, and regretfully I did not catch up with him and his promise of a beer. I headed for the Melting Pot pub which by now had flocks of fans around it, all in good spirits. A ball was being kicked around and it was all good fun, but I was being careful on the drink so after just the one pint, I headed back to the embassy to rest a while again. Here I came across a chap called Thomas, I think from Caerphilly, who was with his daughter. Quite a large lump of a lad he told me how he never sought trouble, but he had seen people off in his time. He told me about a time when he had been set on by three fans of some opposition or other. He had tackled two of them before being undone by the third and had then had a clip round the ear from his brother, not for getting into trouble but for not taking on all three of them! Well we chatted for a bit but I then went back to the Melting Pot, and here I saw Annis Abraham with his posse. Annis is another man who I’m sure never invites trouble but has become a marked man. I went to shake his hand and seconds later, in came a swarm of police. Also at this moment, I ran into an old school friend, Richard, who was going to meet his sister and from there, to pick up some tickets, so with the police taking control of the situation at the Melting Pot, I left that area and with Richard went to a more relaxed location – one of the squares in Toulouse where things were more civilised shall we say. Here, drinkers were treated to a live band, and the spectacle of some Russian ladies, in full regalia walking past. With time ticking on – it was now around 7pm – we at last started to head towards the ground for the match and joined the procession of boozy Welshmen, with the occasional Welsh woman. There were also a few Russian fans of course – we had not been completely segregated, and of course, many of these were quite friendly and unlike the media portrayal of them. While Welsh fans had previously teamed up with English fans against the Russians, now I heard chants of “Wales and Russia, we hate the English!” It seemed like Welsh fans were being quick to change allegiances in order for the party to continue. By far the mood of the Welsh was one of a party spirit, and why not? Finally at the ground, I separated from Richard once again, got myself a programme and made my way to my seat. It was a great sight to see the sea of red as I took my position near to one of the corner flags. The build up was a little drawn out, and for once we were shortly to witness a game that far surpassed any of the build up. You can read other match reports which will go into far greater detail, but of course, succinctly put, Wales simply tore Russia apart, with absolutely fantastic vocal support from fans throughout the game. Bale was on absolute fire, ripping up the rule book and running rings around the Russians. Every time he ran at the defence, it appeared there was only going to be one man who would get through and that was Bale. Ramsey similarly had an absolute stormer and it was his goal that would open the floodgates. At 1-0 of course, no-one could be sure how things might transpire, but a 2-0 halftime scoreline looked very nice indeed. My seat was actually positioned between Swansea supporters either side of me, who initially did not share my optimism of a Wales victory. But of course, it was as the motto says, stronger together for this one, even if I did have to put up with discussions across me of the likelihood of Ben Davies becoming a centre half. “We are top of the league” rang out amongst songs for each player, Chris Coleman, the team as a whole, the national anthem, Calon Lan, and of course the now famous “Please Don’t Take Me Home.” The atmosphere really was phenomenal matched only by the players’ skills on the pitch as Bale netted the third. There were even calls for four goals, but with around fifteen minutes to go, as I predicted, Bale was sensibly rested from his services and quite honestly, only now did Russia start to make any kind of contribution to the match with a couple of shots on target. If the Russians had expected they could muscle their way through the tournament, these hopes had been quashed by the heart of Wales. French police were no doubt breathing more easily now that Russia would be heading home and policing headaches might be eased. Wales had done it, and now the only question was – who would we face next, and could we maintain momentum? Only time would tell. For Fisk, it was time to head back to the Metro and head back home – a wise option given that taxis had been cancelled – if I’d stayed on partying I may never have found my bed. I got back to find my hosts just returning from walking their dogs for the final time of the night. They both looked tired and in no mood to stay up for much longer (they were not football fans), though they congratulated me on the win. I woke to the memories of the night before and to beautiful sunshine. I got up and had coffee in a nearby cafe, basking in the glory of the victory. My hosts suggested I went with one of them for a walk with their dogs, which was very pleasant, though not aided by the language barrier – Fisk’s foreign language skills are appalling to say the least, and while one of my hosts spoke reasonable English, Gillian, who I went walking with, did not, but we went on a very pleasant walk around the nearby canal. Finally it was time to bid adieu and I headed once again for the Metro and now at last to my relief, my more familiar tongue of English. Now the talk was once again of football, and who we might face in the next and subsequent rounds – a match up with Portugal and the prospect of Bale v Ronaldo would be one to savour it was agreed. I had to laugh that the airport had even sealed off the booze section, perhaps for fear that football fans might raid it, but just before my flight, it was opened up and I grabbed a couple of bottles of red wine with my remaining Euros – had to be done! 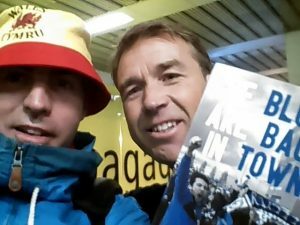 Sitting near to me on the return flight, along with Andy Legg once again, was a guy called Sean who I know from Cardiff (who’d done the sensible thing of travelling ultra light, with not a bag in sight). Sean would later be travelling to Glastonbury. For some, it seems, the party never stops!